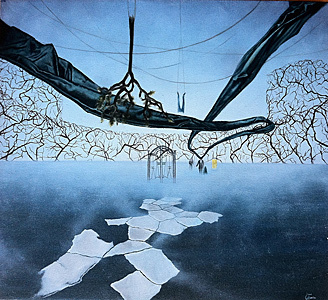 Petrichor features an icy path disappearing into the misty distance with sharp branched looming above. Like the rest of Boechler’s works, this piece is sure to enrich any space with an element of mystery and sophistication. 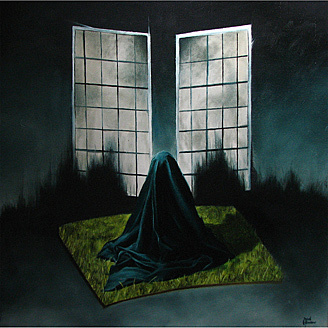 The Cover Up Kid portrays a young boy hidden under a black sheet atop a square patch of grass in front of two windrow covered in shadows. Like the rest of Boechler’s works, this piece is sure to enrich any space with an element of mystery and sophistication. 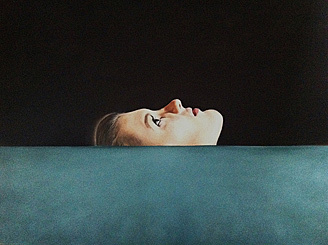 The Still Beginning is an alluring horizontal profile of a young woman peering above a surface. Like the rest of Boechler’s works, this piece is sure to enrich any space with an element of mystery and sophistication. Canadian born, Jared Boechler, makes his American debut in Mahlstedt Gallery’s new exhibition, “Shadow Odyssey.” Jared recently finished his studies at Gail Adams School of Art in Canada. His work has been shown multiple times throughout Canada, especially in the Toronto area. Jared is also the recipient of the 2010 “Best of Show” award at the Saskatoon Showcase of Arts. 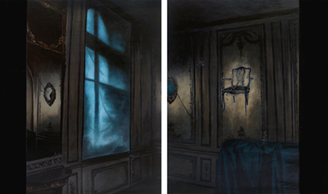 Mahsltedt Gallery is pleased to include three new oil paintings by the artist.